"The key concern post Dignity's announcement of price reductions in January to match the Co-op on Simple funerals was that the Co-op would respond - it now has with a £100 price reduction," said analyst Charles Hall. Dignity's shares were down over 6% as investors feared a price war. Dignity and the Co-op are the biggest players in the UK funeral market, with market shares of 12% and 16% respectively, and are battling it out for dominance. Royal London reported last week that the average cost of a funeral fell very slightly over the last year to £3,757. While the direct costs of burial and cremation have risen, funeral directors have reduced their costs to compensate, Royal London's National Funeral Costs Index indicated. 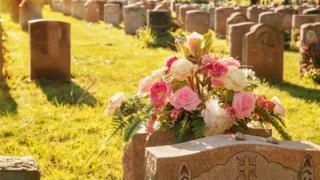 However, a report from Sunlife, which also monitors funeral costs, said in its Cost of Dying report published on Monday that the cost of the average basic funeral had risen for the fifteenth year in a row to £4,271. The Co-op said it was reducing its prices in response to a survey the firm published last month looking at the financial impact of death and bereavement. The survey, conducted by YouGov, found four million people in the UK had suffered hardship following the death of someone close. Robert Maclachlan, managing director of Co-op's Funeralcare business, said the move was part of longer-term focus on "tackling affordability". "In the last two years we have seen a huge shift in the number of clients seeking affordable funeral choices," he added. Almost four times as many people were choosing the cheapest service now, compared with 2015, the Co-op said. As well as promising to charge less than competitors, the Co-op said it would reduce the cost of its cheapest funeral package by £100, and offer Co-op members increased discounts. The funeral services sector has come under pressure this year to become more transparent over the way its products are priced. The Competition and Markets Authority (CMA) launched an investigation in June to ensure consumers were "not getting a bad deal". The results will be published next summer but an interim report is expected before the end of this year. Funeral directors do not always offer the bereaved the full range of options available or give them a full breakdown of what is in each package, according to Ashley Shepherd, managing director of Over 50 Choices, a financial planning consultancy. Families can find they are left with unexpected extra costs for headstones, for example, that they thought had been included. "People don't shop around because they're upset and emotional," said Mr Shepherd. Increased competition in what is largely an unregulated sector, as well as increased digitalisation - allowing customers to compare prices more effectively - are likely to push charges down further, according to James Congdon from Quest, a division of Canaccord Genuity, who has researched the sector. "There is plenty of evidence that prices are too high," he said, particularly when compared to margins in the same sector in other countries. "With the backdrop of the CMA investigation into pricing, and clarity of pricing, perhaps its not a surprise that prices are coming down." According to Royal London, over the last five years the average cost of a funeral has increased broadly in line with inflation.